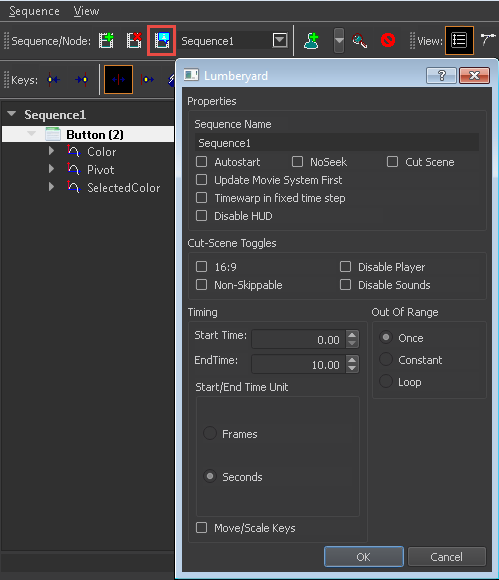 The Node Pane in the Animation Editor displays all the nodes in the selected animation sequence. Each item listed in the Node Pane is considered a node, though they represent different parts of the sequence. You can use the Node Pane to add or delete UI element nodes. Track nodes appear beneath its UI element when you record a track. The animation sequence node, at the top level, contains a list of its UI elements nodes. Each UI element node contains a list of its track nodes. In the UI Editor, select one or more elements. In the Animation Editor, right-click anywhere in the node pane and select Add Selected UI Element(s). In the Animation Editor, in the node pane, right-click an element node and click Delete. In the Animation Editor, in the node pane, select a track node. 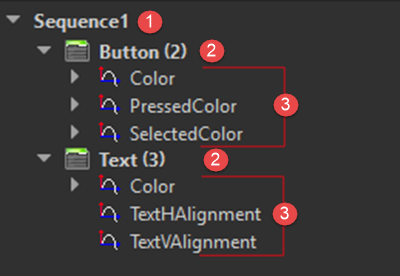 You can also use the Edit Sequence tool to edit the properties of the sequence directly. You can set various properties, such as the start and end time, whether the sequence loops, and so on. In the Animation Editor, click the Edit Sequence icon.